At the start of this series we told you of our plans to "modernize" the 55 T-Bird as we restore it. 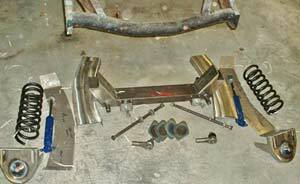 A very significant part of that modernization is the removal of the old, 1950s front suspension and replacement with a Mustang II hub-to-hub subframe and suspension system. Mustang II suspensions are widely used in the hot rod hobby and in many other areas. They are strong, simple, easy-to-configure and provide excellent driveability and handling. Here's what all the stuff looks like when you unpack it and lay it out on the floor. This conversion requires a certain degree of skill and good equipment. Do not attempt to perform this work if your welder can't produce at least 100 amps of current at the tip or if you are not a reasonably experienced welder. You will need an inside coil spring compressor (external compressors are dangerous!) and a number of other tools. This conversion will take 10-20 hours to accomplish. 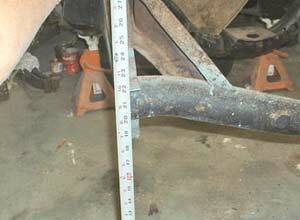 The first thing that needs to be done is to establish the axle centerline and mark its position on the existing frame on both sides. This is best done by stretching a string from the center of one axle hub to the other and transferring the line to the frame, using a level or plumb bob. Of course, the wheels must be turned perfectly straight beforehand. The centerline should be a few inches aft of the center of the upper spring mount. Put jack stands under four rigid points on the frame and take the time to set the frame's height a constant distance from the floor at all four points. Use shims if necessary. Measure, measure, measure! Take the time now and don't go forward unless you know it's right. Measure from the centerline mark on the frame to several reference points. 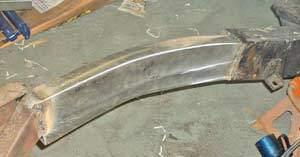 One good point is the hole in the rear that holds the leaf spring's forward attachment bolt (for '55s this should be close to 81 inches). Another is from the edge of the cowl area body mount bracket. Measure from the front of the frame (where the bumper brackets attach) to the mark as well. These reference measurements must be the same for both sides or something is wrong. Measure also the inside frame width in several locations (should be close to 26 inches). Make a drawing of the frame and note these measurements on the drawing. 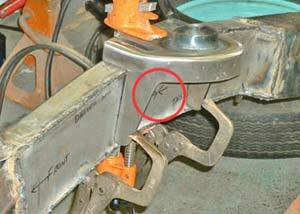 Measure the location of the center of the engine mount's frame plate. This must be measured from the X-frame center and the front cross member centerline. Also, measure the distance from the top of the frame down to the mount plate (8 inches, or close to it). These measurements must be transferred to the new assembly in order to get the mount in the right position. Measure also the positions of any brackets that are welded to the existing frame, as these must be transferred to the new frame sections. Lay out the C-sections of the new frame. Starting with one side of the frame, align the axle centerline points and locate the spot on the inside top of the rearward part of the frame where the C section piece ends. This is where the cut will start, but take note that the cut — at least on the outside of the frame — is slanted toward the front and rear to accommodate the backing plate that will be welded later. It's best not to cut away too much of the frame in that area. You can trim metal away as you fit the backing plate. Use a carpenter's bevel gauge to establish the angle of the cut on the top of the frame and a carpenter's square to establish the vertical cut line. Double-check (triple-check!) the measurements and alignments and then crank up the saw! Once the cutting starts, you realize there's no going back! No saw? It's worth the effort and expense to rent a 10-inch steel-cutting circular saw for cutting the frame. They rent for about $40 a day and will make short work of the job. Before cutting the frame, cut out the crossmember holding the engine mount to get it out of the way. 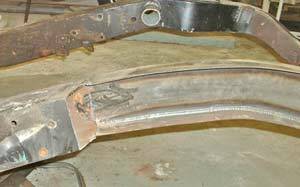 To minimize chance of error it's best to cut out one side of the frame and tack-weld the new frame section before moving to the other side. Using this approach assures that at least one side of the frame stays in alignment (height, width, twist, etc.) and can be used as a reference to get the new side's components set up correctly. Ready, now? Cut away! There's nothing but air between the frame's two ends. Once the frame area to be removed has been cut out, grind the edges and clamp the new frame "C" section in place. Before welding, ascertain that all original measurements are correct and that the new section isn't bending the front frame down, up, in or out. Measure, measure, measure, and when you're certain everything is correct, tack-weld the pieces. Remove the clamps and re-measure, then run continuous weld over all surfaces where the pieces join. Once the C-section has been welded in, place one of the four diamond-shaped plates inside the rear part of the joined sections and mark where it will be welded in. Grind the mating surfaces clean and weld the plate in, then do the same for the forward frame area. These plates provide additional stiffening for the frame and should not be overlooked. Remember, the entire car will rest on the frame. 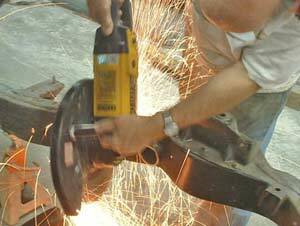 It will then twist, move, stop and accelerate, all of which attendant forces will act upon the weld joints. They'd better be strong! Okay, the C section is welded into place. The plate is welded in, finally. Now it's time to weld in the "C" section's backing plate. Since the plate is curved (vertically) and has angled ends, you have to be careful to fit it properly into the frame opening. The safest way to do this is to conservatively (that is, deliberately err on the short side and then grind away the excess) mark areas of the frame to be cut away and keep fitting the plate into the opening until everything lines up properly. Patience — and the judicious use of the grinder — will pay off here. Once the plate fits properly you can grind edges and clamp everything in place. There's a lot of welding to do here, about 40 linear inches, so take your time and weld various sections to avoid overheating the metal. Remember to take into account your welder's duty cycle too. You don't want to blow the circuit breaker. With all the welding done you can move to the other side of the frame and repeat the process. Measure frequently and bear in mind that this part of the project will take a lot of time. When you get tired, stop! There are no magic elves who will finish the work for you overnight. It will be there whenever you feel like continuing and no one is getting judged for speed. Once the frame sections are welded it's time for the center cross member to go into place. This component is marked with the axle centerline and its marks should line up with the "C" section's centerline. If it doesn't, there's something horribly wrong, but if everything has been measured up to now, the cross member will line up. The cross member is heavy, so the best way to "clamp" it in place is to jack it up from underneath until it contacts the frame, and then slightly lift the frame off the jack stands. This will apply more than enough clamping pressure for welding. Make sure the centerlines are mated and the cross member isn't twisted where it meets the bottom of the frame. If the cross member's inside lip doesn't quite snug up to the inside of the frame, slide an appropriate piece of shim material into the gap to allow for a good weld joint. 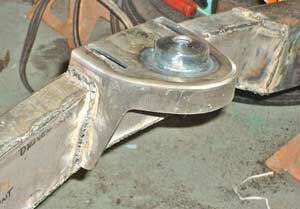 Every joint where the cross member and frame touch must be welded its entire length, so take your time and get to work. Don't try to hold this in place by hand, use the jack! Once the cross member is welded into place you can install the spring/upper A-arm housings. These also have the centerlines marked, so aligning them to the frame sections should be easy. A slight amount of the inside edge of the housings has to be ground away to fit the curvature of the frame section, but otherwise the housing should wrap over the top of the frame section and fit snugly. As with the cross member, every joint where these components meet must be welded over its entire length. The spring/A-arm housing has to be located on the centerline and clamped well. Arrows mark the centerline (in the red circle). Once all the above components are welded into place, go back and check all the welds for quality. Touch up any area that needs it and then grind or smooth out everything until it meets your standards for visual appeal. Prime and paint the bare metal components after you've cleaned them up. Once the paint is dry you can install the steering rack. Two mounting bolts and associated bushings/washers secure the steering rack and these must be tightened properly. 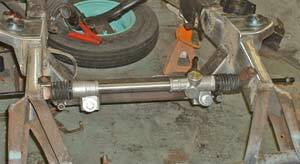 Test the steering rack for ease of operation. It's all welded, now for cleaning and painting. The rack and pinion steering is bolted into place. 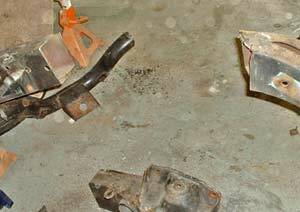 Before going any further, get the grease gun out and fill the tie rod ends and all four ball joints with grease. Next, install the lower A-arms. These are held in place on the cross member by long bolts and locking hardware. It's possible to install the arms upside down, so make sure the ball joints are facing up. Roll a floor jack under the A-arm to position it close to horizontal. Install the upper A-arms using the special attaching bolts. Position each roughly in the center of the two slots in the upper housing and lightly tighten the bolts. 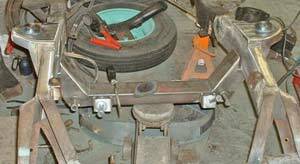 Using the spring compressor, position each spring (with its rubber insulator) into the housing and compress it to allow fitting into the lower A-arm's "saddle." It has to be compressed enough to allow installation of the spindle assembly onto the upper and lower ball joints. Note: there is a top and bottom to the coil springs. The top has a white stripe painted onto the coil. The spindle assembly is heavy, so make sure it's the correct one for the side on which you are working. Position it onto the lower ball joint and then push the upper ball joint down into the spindle's upper mount. Quickly hand-turn the castle nuts and washers that hold the ball joints in place to keep everything together, then tighten the nuts as firmly as possible before the coil spring is released. The new suspension is completed. 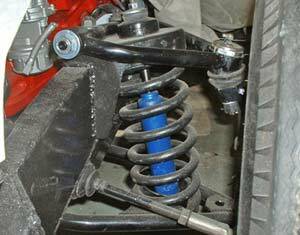 Make sure the coil spring's end is positioned into the lower A-arm's spring saddle and then slowly release the compressor's tension. The spring will stay in place once it expands enough, but take your time to get it right. Once the spring has expanded into place and all tension is off the compressor, take it out and double-check the tightness of the ball joint castle nuts. These must be tightened as hard as you can pull the wrench, after which you need to install the cotter pins. Assemble the other side and you're almost done. No. There's no point in trying to align the new suspension until the entire frame is fitted with the engine, transmission, drive shaft, etc., and the body is completely assembled and "drive-ready." For now, straighten the front wheel hubs by eye and center the steering rack. Once centered, hand-turn the tie rod ends until they fit the wheel positions and insert their shafts into the steering arms. Hand-tighten the castle nuts, just to keep the tie rod ends from falling out and allow you to steer the wheels.